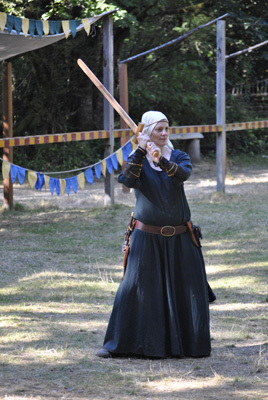 Just for grins, I'm sharing a couple of photos of my first long sword lesson that were photographed summer, 2010 at Camlann Medieval Festival, in Carnation, Washington USA. (www.camlann.org). 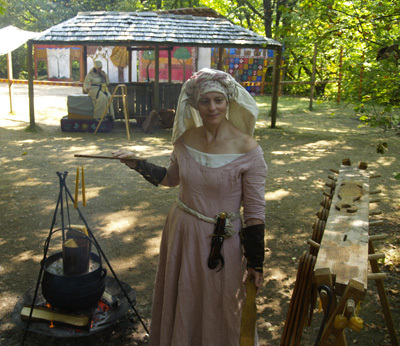 I re-enact the village candle-maker, (Lucy Chandler), but figured, if I am going to start drawing, and painting men in battle or other medieval military illustrations, I had better al least know how to hold a blade. Dipping paddles, and vats of molten wax are currently more dangerous in my hands. Low Guard: Gosh, that squire was cute. Huzzah! 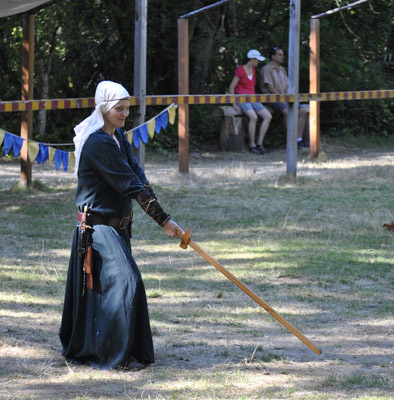 Good to see Camlann represented here! Isn't 2011 their 30th anniversary? I'm not sure if we just finished our 29th or 30th season. I just finished my 24th summer there. I'll be singing at Yule Feasts this month, (I started out as a minstrel at Camlann), but I feel a bit worried. In this economy, we might not be able to afford a 2011 Festival. It would be a tragic loss to historical re-enactments of such quality, and faithful adherence to period accuracy. If you make it to a Yule feast, stop and say hello!